24 March is the tenth anniversary of NATO's intervention in the Federal Republic of Yugoslavia. Ten years later, I wonder if we remember – in Serbia and in Europe – why bombs fell on the former Yugoslavia, if we are aware of the consequences of what happened, if we learned anything. The Serbian Orthodox Church, in its turn, remembered the victims of the raids, in all sacred places in the country and abroad, with ceremonies starting with the ringing of bells at 6:45 p.m.- the time when the first bomb fell on our country. The Church is organising a further commemorative meeting at Sava Center, Belgrade's congress centre. The Democratic Party of Serbia (DSS) asked Belgrade's administration to dedicate a street or a boulevard to all the victims. Radicals and other guardians of quintessential 'Serbianness' are organising a ritual of remembrance for the day the first alarm was heard. Let's hope everything is at least quiet. This is what I always think when those who wreck Belgrade draw attention to the wrongs against Serbia and the Serbs call for “peaceful, dignified” meetings. I am not sure I want to be in Serbia on 24 March. My stomach cramps when I think of that date. I do not know whether I feel more ashamed of those who organise meetings and prayers in commemoration, or those who exploit the date to stress how Serbia is subjected to unfair punishment everyday. The latter are the so-called political parties of the right and the self-professed patriots and patriotic movements, looking to score another easy political point. There are also those who keep their mouths shut, those who have nothing to say, those who bring flowers to the graves of those who died in the bombing of the Radio-Television of Serbia. And yet, I do not feel close to those who say that Serbia had it coming and the raids were a good lesson either. Neither do I agree with how no dialogue was opened on the subject, in Serbia or Europe. 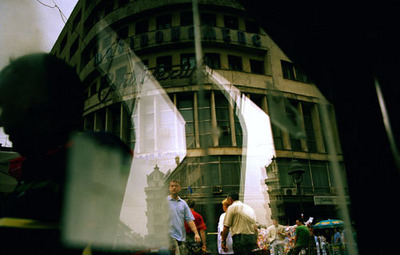 There is no discussion of how the intervention changed the image of contemporary Serbia, the country or society itself. No one seems to deem any of this worth discussing. In today's Serbia, nobody pays attention to the ruins of buildings and bridges in Belgrade, Novi Sad, or other places. To be honest, nobody notices them. They are part of us as if they had been there for centuries, ever the same. Yet, it is not about the buildings, or even their symbolic value: it is about the wounds that cannot be healed if sealed in silence or vanish just because we are too scared to open that chapter...and all the chapters of our recent past. Today, we ask ourselves how Serbia ended up with violence haunting all layers of society, values fluctuating, crime and arrogance reigning undisturbed. What will become of the young generations that grew up under the bombings and afterwards. They do not remember why Serbia was bombed in the first place but very well recall how their parents ran for the basements and how bullets from invisible airplanes whistled over their heads. And they remember Šizela and Mirela, the alarms that marked the beginning and the end of the airborne danger. Is there going to be someone, on 24 March, who talks about them - these generations - perhaps irreparably lost and to whom the name Slobodan Milošević means nothing? The conversations are all about Kosovo instead. Many scream that Kosovo is Serbia's Holy Land unjustly taken away. Many will repeat that Serbia was bombed because “those people,” the”aggressors,” the “enemies of Serbia,” the “unfair,” the “creators of the new world order” wanted – at all costs – to take Serbia's cradle, her irreplaceable core, away from her. What do they know about Kosovo? Everything and nothing. They grow up under the weight of the new Kosovo myth. They do not know of or remember the wars in Bosnia and Croatia and sanctions mean nothing to them. They listen to my generation's stories of fighting against Slobodan Milošević's regime like we used to listen to the partisans' stories we were told once upon a time: interested, but distant. Their lives had just started when the bombs began to fall. They are angry. They are also frustrated and imprisoned – confused, mostly. They learned that Europe is their home, but they cannot figure out why that very same Europe bombed them. They do not understand the difference between international law and a special case. They feel like they are always being punished for something they had nothing to do with. They grew up with aggression and they express aggressiveness. They scream at the demonstrations against Kosovo's declaration of independence and without much of a thought, they throw stones at the embassies of “enemy” countries – they also steal sneakers from the crashed windows of Belgrade's shops...as a demonstration of the unacceptability of Kosovo's independence. To be honest, it is an expression of impotence, of the inability to discuss and debate on these themes. It is not their fault, it is our fault. We do not know how to “heal” from the bombings. Did we “deserve” it? Can bombs bring peace? What did we learn? What is Serbia today? What is the Serbian identity? We say our place is in Europe and the European Union: so believe 60% of Serbian citizens. But our place is not in NATO; only 20% support Serbia joining the Atlantic Alliance. The reasons are clear to all – even more so on 24 March, 2009. Still, I do not expect anyone, in Serbia or in Europe, to talk openly about the bombing of Serbia, now or in the near future. It is much easier to remain silent. As if nothing had ever happened.